Three classes of membrane active peptides (MAPs) are considered in this review: cell penetrating peptides (CPPs); anti-microbial peptides (AMPs), and amyloidal peptides. We summarize both experimental and theoretical results for several representative peptides in these different classes, which highlight commonalities in their interactions with model lipid membranes. While it is clear that no fixed set of mechanisms completely characterize any particular class of MAPs, there is certainly evidence that common mechanisms can be found within and between classes. 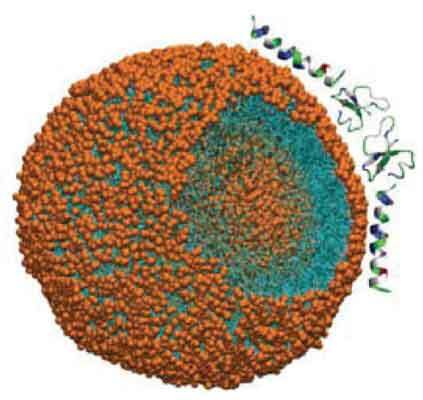 For example, CPPs appear to undergo rapid translocation across lipid bilayers through small transient pores, which nevertheless appear not to cause persistent damage to membranes. On the other hand, AMPs also show evidence of rapid translocation, but associated with this, is membrane rupture to form large pores, which are subsequently stabilized by peptide adsorption to the pore edges. This disruption to the membrane is presumably responsible for cell death. Amyloidal peptides also show evidence of stable large pore formation, however, the mechanism for pore stabilization appears linked with their ability to form fibrils and prefibrillar aggregates and oligomers. There is some evidence that pores and membrane defects in fact act as nucleation sites for these structures. Where possible we have related the experimental and theoretical work to our own simulation findings in an effort to produce a comprehensive, albeit speculative picture for the mechanisms of action for this important group of peptides. Amyloid peptides, Anti-microbial peptides, Cell-penetrating peptides, Lipid membrane, Membrane active peptides, Pore-formation. School of Physical, Environmental and Mathematical Sciences, University of New South Wales, Canberra ACT 2600, Australia.